The Medical Alert Wallets genuine leather Medical pouch is great to carry about for use as a Medical wallet to carry your current medical information. 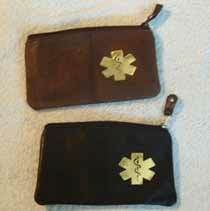 This Medical Pouch is made of genuine cowhide leather in one color, dark brown. The medical symbol is gold color Hot Stamped on the outside. Shipping outside the United States and Canada require different shipping and handling charges, Please contact us for approximate charges. You have a better chance of correct medical aid and early diagnose with the help of the Medical symbol and your current health information you've printed on the Medical Information Card in your new Medical pouch. 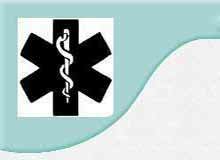 If you have any allergies, medical conditions and/or take medicines, then you should have a Medical symbol on you somewhere. Inside has the Medical Information Card which you have filled out with your current medical information.